This quarter’s Mentor Spotlight features Brandon Clifford, a registered and active mentor of the Military Entrepreneur eMentor Program. 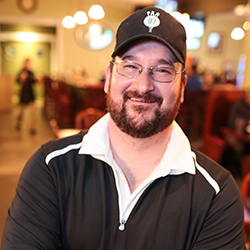 A graduate of Saint Michael’s College, Brandon Clifford entered the workforce as a sales and marketing representative and has since opened three acclaimed restaurants (Pub 97 in 2006, Café 97 in 2012, and the hit golf-themed sports bar Par 97 in 2014). Eager to share his extensive knowledge about the art of creating and maintaining a business, Clifford then founded Global Franchise Solutions, a company that seeks to help other hopeful entrepreneurs. He now acts as a mentor and consultant, using his expertise to guide prospective business owners down the same path he walked. Global Franchise Solutions offers free franchise assessments for aspiring and current business owners. You can learn more about what Global Franchise Solutions has to offer at www.globalfranchisesolutions.com. From the eMentor Team: Thank you, Brandon, for giving back to the veteran and military family community so that others can continue their quest for business success.